Have you any plans for the weekend of May 4/5/6 of this year? Well I hope against all hope that watching Leinster play rugby isn't one of them. That might sound a bit odd coming from someone who likes to harp on Leinster playing rugby week in week out, especially since the season will have a few weeks left to run at that point and hopefully we'll have at least one trophy still in play at that time. But as you probably know, the reason I want that weekend to be free isn't because I have alternative arrangements, nor is it because I'd rather watch other sport that weekend like the Premier League or even the Kentucky Derby. No I want Leinster off because that is the reward for first place in Conference B, and if things go well against the Scarlets in a couple of weeks, we'll need every minute of the two-week period to help us prepare for the big matches that round off the campaign. And after things away from home didn't go our way since the start of the Six Nations, our lead over the second-placed Scarlets of three points [though technically four with pts difference] is one that can't be taken for granted. We certainly can't assume the reigning champions are going to falter over the remaining weeks, even if their next two matches are against the strongest pair of Scottish clubs form-wise this league has ever seen. You rule out the likes of Wayne Pivac and Tadhg Beirne at your peril...all of Europe knows that at this stage. So while our own challenges for this weekend against the two Italian clubs at the RDS might appear 'easy peasy lemon squeezy', the job still has to be done, and by job I mean five match points on both occasions. Nothing less will do. 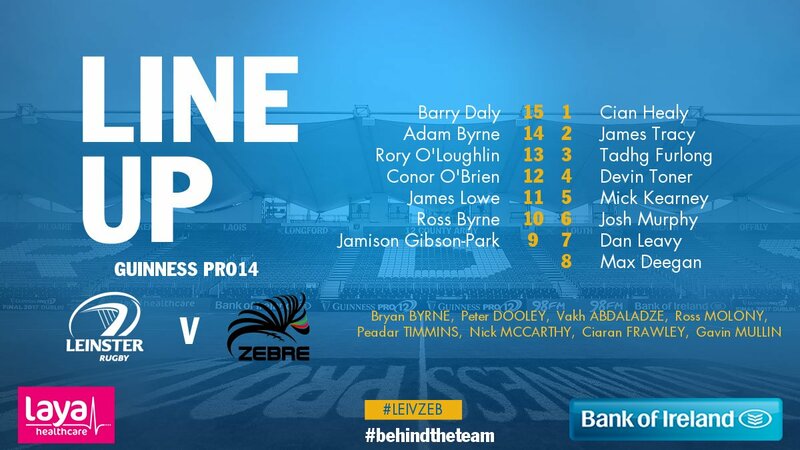 As you can see from the lineup, to rest key players ahead of the Champions Cup semifinal we have had to dip rather heavily into the Leinster A pool for this Saturday, but having seen them triumph over their Munster counterparts that's not necessarily a bad thing. I'm particularly looking forward to watching Conor O'Brien play at 12. Going into this season centre options were a problem for us should he continue the form he showed at Energia Park on Good Friday, he could well be a good solution for the future. All in all it's a real patchwork of a matchday 23 - I certainly raised an eyebrow or two seeing both Cian Healy and Tadhg Furlong starting but it will be great to see some of the heroes from last Sunday, also of course James Lowe. But the biggest honour of the afternoon goes to Devin Toner, who deservedly gets the opportunity to skipper the side for the first time. I have often been critical of him over the years...he made his debut very young and for the first few years he seemed to have little more than height going for him from my standpoint. Gradually though he bulked himself up and as the years went by he gained the confidence to put himself about the park and in the last couple of seasons what I notice as his last failing - frequently losing the ball in contact - seems to have disappeared as well. As far as Leinster and Ireland are concerned, his role right now couldn't be more crucial...James Ryan has been hailed in many quarters as the 'new Paul O'Connell' so if that's the case [and if performances in recent weeks are anything to go by it very well could be], there's no better man than Devin to pass on all he learned from Paulie over the years. These games are also a great stage for Ross Byrne. You have to feel for him - having played a large part in Leinster's successes this season not only in the Pro 14 but also in Europe, it's a shame he's unlikely to be in the frame for the knockout matches barring injury, although it would be hard to leave out a fully fit Carbery all things considered. Another who might be unlucky to lose ou is Jamison Gibson-Park, though in his case he would probably be left out on eligibility grounds rather than form...let's just say I hope Saturday's half-back pairing applies maximum pressure to the coaching staff by leading us to maximum points. Have we anything to worry about from the visitors? Well, they have won only four times this season and although one of those was in Galway just a few weeks ago, their latest tonking in Glasgow suggests they might have their minds set on their final two matches, first at home to the Dragons before finishing off with a derby against Treviso. One thing is for sure however...I couldn't see Michael Bradley coming to the RDS without having his squad ready to compete to the very best of their ability. Yikes - thirty-four points is what the bookies say. Dare I say more? Screw it - yes I do dare, though I'll say just thirty-five. To be honest I'm not all that fussy about the margin, I just want at least four tries and at most zero injuries, both of which would apply full pressure on the Scarlets who kickoff later that evening. Available: 16 Roberto Tenga 17 Andrea De Marchi 18 Cruze Ah-Nau 19 Eduardo Bello 20 Luhandre Luus 21 Guglielmo Palazzani 22 Serafin Bordoli 23 Giovanbattista Venditti.